With MWC just around the corner, tech enthusiasts around the globe are gearing up for a week full of smartphone launches. However, to everyone’s surprise, South Korean tech giant Samsung, which usually debuts its latest Galaxy devices at MWC has decided to host a separate fixture to announce its upcoming S series flagship(s) on February 20th in San Francisco. While the company prepares for the launch, Rumourville is buzzing with various leaks surrounding the device. 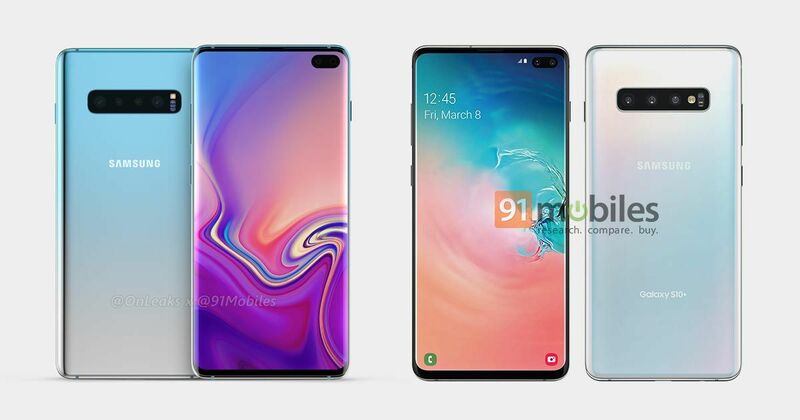 Just last month, we brought you the high-res CAD renders of the Samsung Galaxy S10+ in partnership with Onleaks. And now, 91mobiles has managed to get the official press render of the forthcoming smartphone from a reliable source. Behold the Samsung Galaxy S10+. 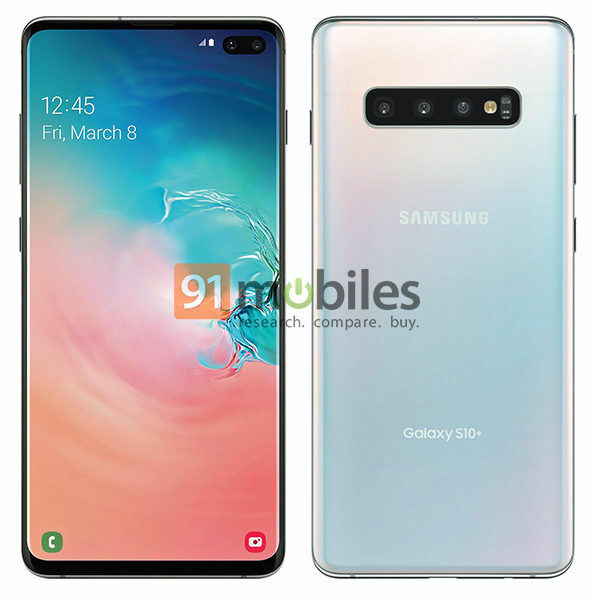 As can be seen from the image, the press render of the Samsung Galaxy S10+ looks quite similar to the factory-based CAD render we presented to you recently. First and foremost, the handset appears to ship with the now in-vogue punch-hole display which houses not one, but two selfie cameras. Our best guess is that Samsung is following the footsteps of the Google Pixel 3 XL (review) and is offering a wide-angle selfie camera along with a standard front shooter. What’s more, the punch-hole design fits in line with Samsung’s Infinity O display technology, which the company talked about at a press conference back in November. Thanks to the use of such design, the bezels surrounding the display on the Galaxy S10+ are noticeably slimmer. As per leaks, the smartphone will ship with a 6.4-inch display, akin to the Galaxy Note9 (review) and will likely offer the highest screen-to-body ratio for any Samsung smartphone yet. As for the resolution of the panel, our bet is that the company is furnishing its latest flagship with a Super AMOLED display with QHD+ resolution. Another interesting tidbit you’ll pick up on from the official render is that unlike its predecessors, the smartphone doesn’t sport a capacitive fingerprint sensor on the back. This corroborates with reports which suggest that Samsung’s upcoming flagship will feature an Ultrasonic in-display fingerprint sensor, which is a first for the company. As always, we can also expect to see Samsung’s Intelligent Scan feature which uses both face unlock and Iris scanning technologies for authenticating the user, and with the dual-selfie camera setup, it might have been improved further. The button placement seems to be standard on the upcoming Galaxy S10+, and you’ll be able to spot the volume rocker and the infamous Bixby button positioned towards the left spine. The right edge of the device is the home to the power button. While the press image doesn’t shed any light on the positioning of the ports, our previous leak suggests that the smartphone will retain a headphone socket, which will be placed alongside the USB Type-C port towards the bottom. Lastly, it’s clear that the upcoming Galaxy S10+ will ship with a triple camera array on the rear, flanked by an LED flash. 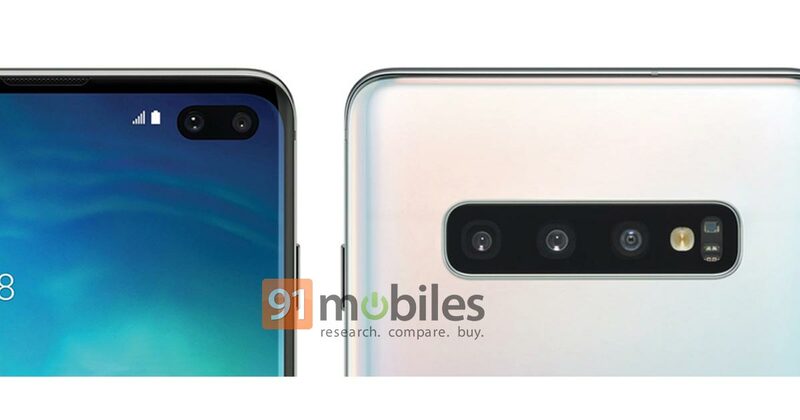 If you’d remember, our previous leak suggested that the smartphone might ship with four rear-facing cameras (check the image above with both renders side by side, for your reference). However, the official render gives us a clearer picture (no pun intended) of the flagship’s rear camera setup. The cameras have been positioned horizontally, and are expected to sport a telephoto shooter, a wide-angle sensor, and a standard lens. The company also seems to be experimenting with new gradient hues, as the official render (the one on the right in the image above) sees the smartphone sporting a new colourway, expected to be called ‘Prism White’. We zoomed in on the S10+’ display and by the looks of the flat-styled dialer and camera icons on the lockscreen, the smartphone appears to be running the company’s latest One UI based on Android Pie. What’s more, rumours are rife that the Galaxy S10+ or one of its variants will support the latest 5G networks. 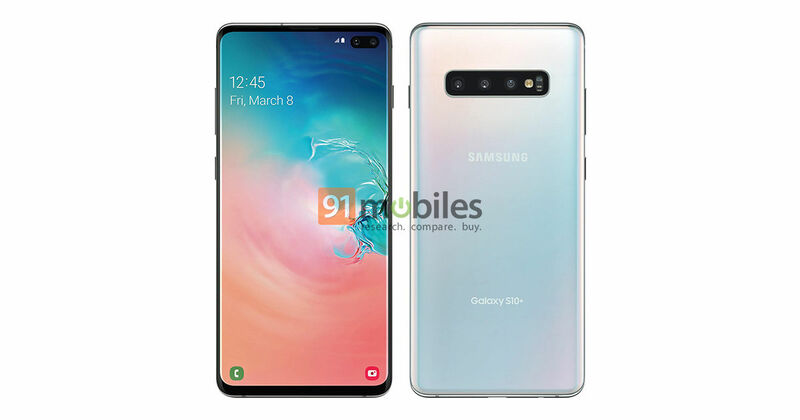 As for the rest of the specs of the smartphone, the handset will likely be powered by two different chipsets and depending upon the region, users will get the Samsung Galaxy S10+ with either the Qualcomm Snapdragon 855 processor or the latest Exynos 9820 SoC. The smartphone is expected to ship with up to a terabyte of storage and at least 6GB of RAM. That’s all the information we have on the upcoming Galaxy S10+ for now. Do let us know of what you make of the design language of the company’s upcoming flagship in the comments below.